The next piece I want to feature is the Peaceful Tree Print. Besides being the second piece I listed on Etsy, this is also the second piece I had framed, after "Three Elephants". 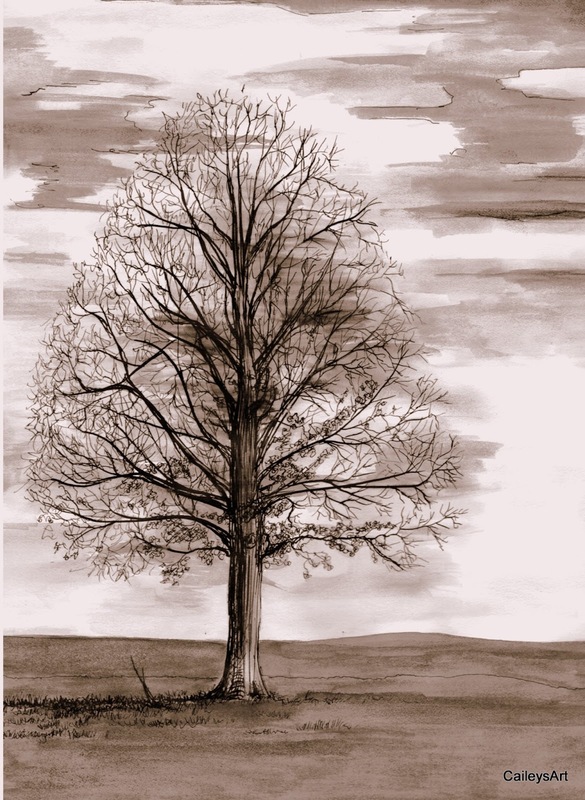 I drew Peaceful Tree (originally Lonely Tree) from life, which was pretty time-consuming. I took my ink, dip pen, and paper, sat on my front porch, and spent a couple of hours just drawing my neighbor's tree. I didn't even pencil in guidelines. The fact that I drew this tree from life in ink with no pencil makes me feel really good, because that's not exactly easy. I mean, ink is permanent! And bare trees aren't easy. When I finished the tree, I decided it was good enough to give it a background. I knew I was working backwards, but originally the tree was going to be a "study", or just practice. So I watered down some ink and painted in the background and the sky. And then I felt really good because to be honest, it looked really good! And then I got it framed for an art show, and I felt really, really good because the frame and matting is perfect. A friend of my dad's framed it for me, and I'm so impressed. Honestly, if you've got something you need framed, let me know and I'll give you his contact information. Now, this piece is hanging in my living room and I always feel so good when people walk in and ask my parents about it. And I always feel good when friends or family members mention it to me, which they often do. So basically Peaceful Tree is a big ego-booster for me, and I say that with all the shameless pride of a parent looking at her child. Or maybe I just say that with shameless pride. I'm a young artist and writer hoping to find my way in this big bad world. See Cailey Color is all about my artwork and the stories and inspiration behind each piece. Here, you get a little sneak peek into my world of family, friends, childhood memories, and whatever else inspires me to "color pictures". If you see or read something you like, feel free to share your thoughts in the comments! A BIG Announcement: See Cailey...Write?